Today, Codemasters announced that F1 2015 will be coming out for new consoles and the PC this June, the earliest release date in the series’ history, and promise a number of new improvements over the “last-gen” versions of the game. They also promise the the 2014 season will be playable in-game for free “as bonus game content”. Which is very nice, but which is also sure to deepen the widely-held suspicion that F1 2014 was a phoned-in “contractual obligation” release while Codemasters instead focused on the 2015 edition. 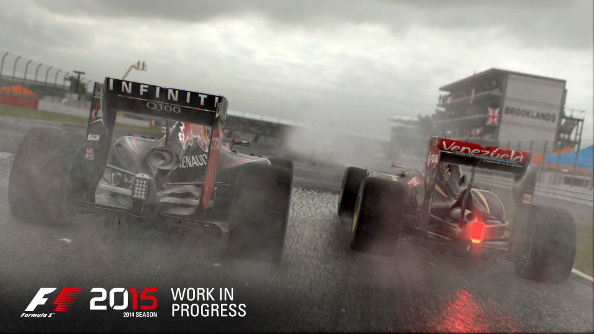 F1 2014 was a massive stumble for the Codemasters’ F1 franchise and garnered the worst reviews in the series’ history. Codemasters themselves barely seemed to promote the game, sending out a few “hot lap” videos and trailers, but they certainly weren’t celebrating any exciting new features the way they did back in 2013. In fact, the classic cars and tracks that promised such great things in the 2013 edition of the game were gone! PC Gamer reviewer Phil Iwaniuk summed-up the views of a lot of the racing community when he suggested, “it’s little more than a dancing monkey to hold your attention until the proper game is ready. Now, oddly enough, here comes the 2015 edition of the game a full three or four months ahead of the series’ usual release window. And the F1 2014 season is part of the game for free! Almost as if there had never been a real 2014 release. And there’s the rub, for F1 racing sim fans. The 2014 release was shabby, and left fans feeling shabbily treated. I like to think most saw the writing on the wall and skipped it, but the fact remains that it was a poor product in a series that has, at times, felt like steadily diminishing returns. Especially for those of us playing on PC. 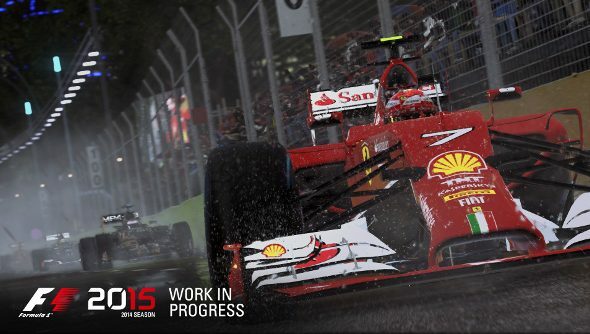 It’s exciting that F1 2015 will be out soon, and it will be designed for more modern hardware. But F1 2014 dug a hole for the entire series, and F1 2015 will have to be an Adrian Newey-like feat of design to get back into contention with promising, PC-friendly games like Assetto Corsa and Project CARS. So, in other words, the handling model has been refined again, and the game looks prettier. Uh-oh. What about the classic cars and races? What kind of options will be offered for those of us who fell in love with the career mode of the earlier games, and their painstaking career progression and tracking of milestones? I’m always willing to give the F1 series another shot. F1 2010 is one of my favorite racing games of all time, and 2013 showed promising directions for the future of the series. But as a fan of F1 and racing games, I need some reassurance that F1 2015 is going to be more than an incremental improvement to graphics and simulation fidelity. It needs to be a game that gives back to fans the stuff they already enjoyed in previous games. Especially considering how this announcement tacitly concedes that last year’s game wasn’t a proper instalment. Otherwise, my copy of F1 2013 works just fine, and Project CARS is on its way.